Watercress (Nasturtium officinale and Nasturtium microphyllum) are both extremely common plants in the British Isles. It is difficult to distinguish between them vegetatively or by taste! Nasturtium microphyllum, the one-rowed watercress, is very similar to Nasturtium officinale and is called one-rowed because the seed pods have the seeds in one row as opposed to the two rows of officinale's seed pods. Also the leaves and stems of microphyllum tend to turn purple-brown in autumn whereas officinale's stay green. But as the two species hybridise freely, the difference is a little academic. The hybrid between the two, (Nasturtium x sterile) is more-or-less sterile: apparently if the female parent plant os officinale some seeds are produced. Watercress particularly likes clean, cold, hard, running water and plenty of sun so it's very fond of chalk-spring fed streams. But it's surprising in just how many places you can find it. Many garden centers are selling it as a pond plant (though I doubt it ever flourishes!) and the seed producers have even raised a variety that they claim can grow satisfactorily in ordinary soil. Commercially watercress is either Nasturtium officinale, known as green or summer cress or Nasturtium x sterile, known as brown or winter cress. Seeds of Nasturtium officinale are commercially available and it is easy to grow in almost any damp conditions. The leaves of wild watercress are rarely like shop-bought watercress. Commercial watercress is not allowed to mature, so the leaves are immature, so quite round. 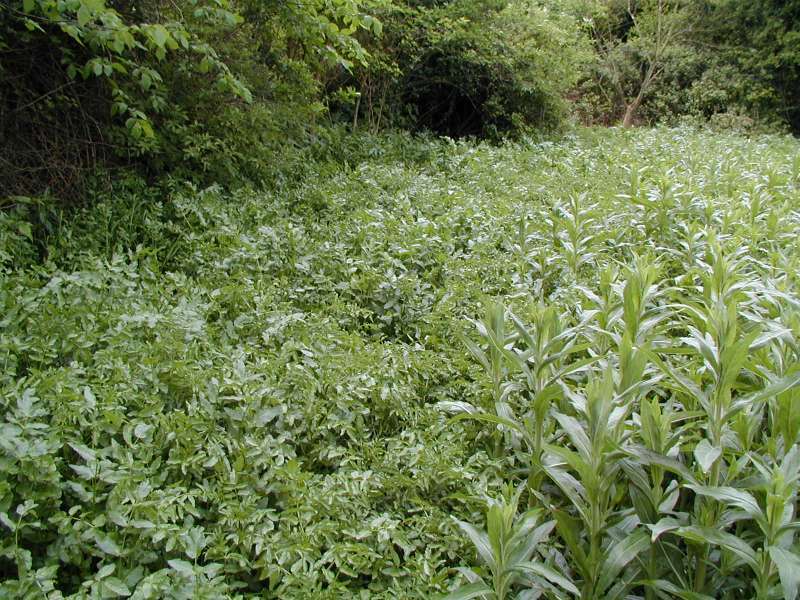 Wild watercress will have mature leaves, described as lyrate-pinnate. The latin name Nasturtium comes from "nasi tortium", meaning "nose twisting". 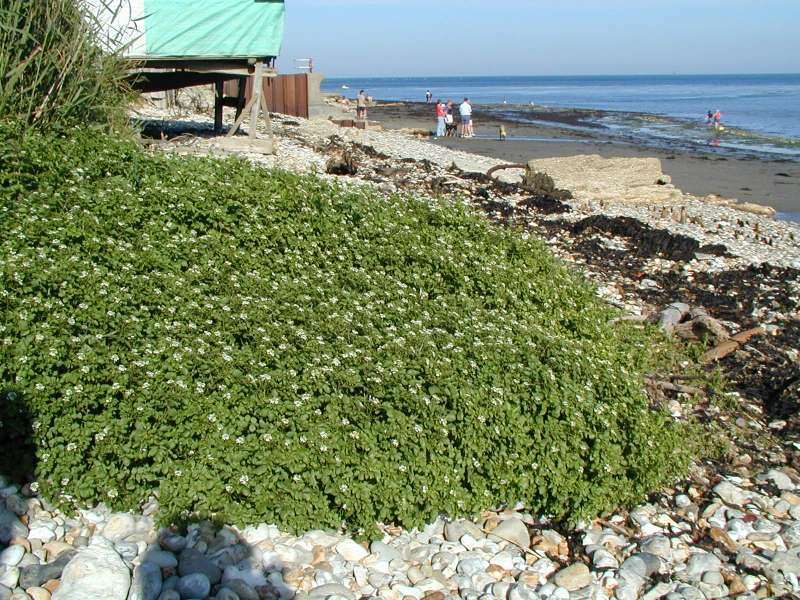 The first picture shows a watercress bed in our local spring at Burwell (taken 19th May 2001) and the second a luxurious patch of watercress growing, of all places, on the beach at Bembridge in the Isle of Wight (taken 18th August 2001). However a small and continuous trickle of water flows from a spring in the cliff behind! Click on the picture to download the full size version. A word of warning: if you are considering eating wild watercress be sure to pick it from a stream that is not accessed by sheep or cattle. There are parasitic liver flukes that infect sheep and cattle and whose life-cycle involves freshwater snails. The flukes reinfect cattle via a larval stage that encysts on water plants (such as water cress) that may be eaten by the sheep or cattle. If a human ingests these larvae, they too can get infected. Wikipedia has a good article on the common liver fluke, Fasciola hepatica. See also my own thoughts on how to gather wild watercress safely. Watercress is mistaken (by some people!) 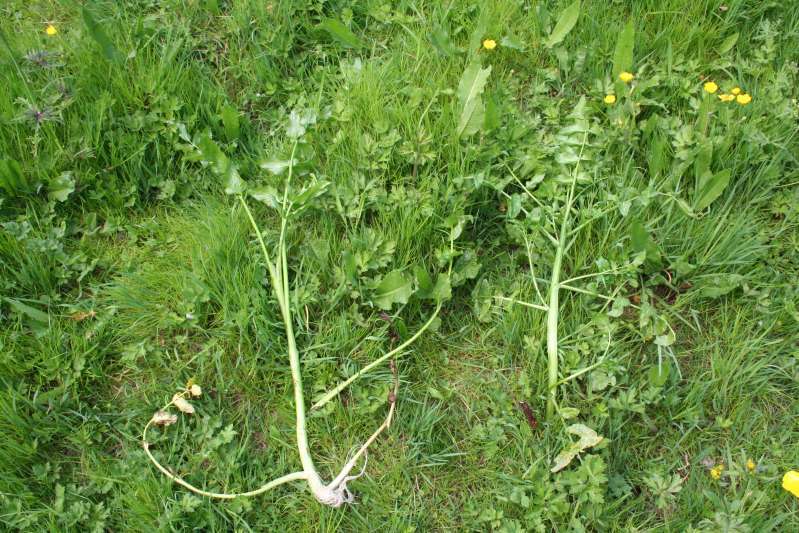 for apium nodiflorum (Fool's watercress), which tends to grow with it - in fact some two years after the first picture was taken, the local spring contained little true watercress and lots of Fool's watercress. 9th May 2008: the local water cress is now outgrowing the fool's watercress. Fool's watercress grows better at low temperatures, but at higher temperatures it seems true watercress grows faster. Picture 3 (taken 9th May 2008) shows this bed. In picture 3, the fool's watercress can be seen mixed with normal watercress. The fool's is slightly bluer than true watercress and the wild watercress above has distinctly crinkly leaves. The fool's leaves are flatter. Picture 4 shows a watercress plant on the right and fool's watercress on the left. Fool's watercress is an umbellifer (celery family) and the leaves clasp the stem and tend to spring from the base of the plant. Watercress however is branched (it's of the cabbage family) with side branches in the leaf axils. Photos 3 and 4 taken 9th May 2008. Fool's watercress (apium nodiflorum) is not poisonous, though I find it does not taste nice. It is also closely related to Apium graveolens (celery). 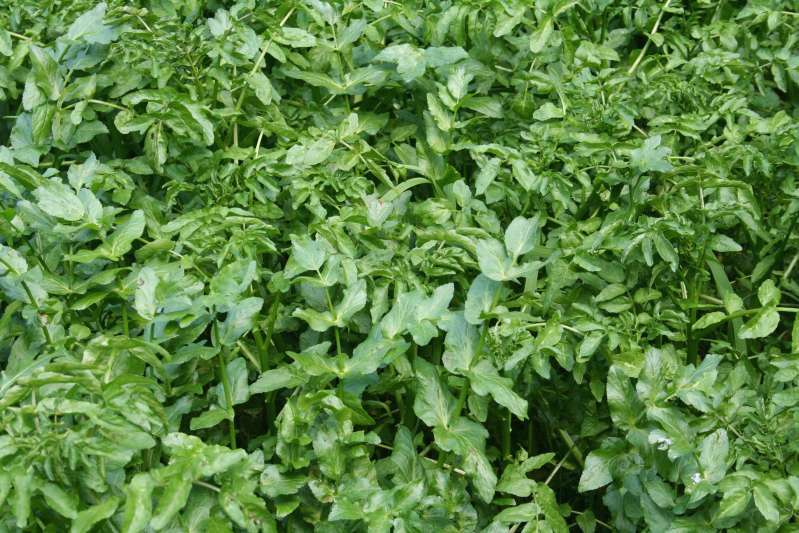 However, fool's watercress is very similar indeed to the poisonous berula erecta, or lesser water parsnip. However berula erecta is not poisonous, at least in small amounts to humans according to Plants for a Future. Both apium nodiflorum and berula erecta are umbellifers whereas watercress is a crucifer (cabbage family) so the plant shapes are distinctly different once you know what to look for. Notice the Fool's watercress leaves tend to come off the base and tend to clasp the stem, as celery. True watercress has a stalk with leaves coming off nearly at right angles. Berula erecta smells distinctly like parsnip when you crush the leaves (hence its common name). Neither it nor apium nodiflorum taste peppery, like true watercress. I recommend you identify all three before making any mistakes! All three - Nasturtium officinale, apium nodiflorum and berula erecta have white flowers. All three are distinctly green but, like most water plants, can go reddish when stressed though true watercress is much more likely to do this. There are actually two types of watercress: Nasturtium officinale and Nasturtium microphyllum, or 'One-rowed Watercress'. The difference is in the seed pods, officinale having two rows of seeds. Otherwise, the two are virtually indistinguishable and so similar that they hybridise. Apparently commercial watercress is a hybrid. Apium nodiflorum (Fool's watercress). Covered above! Veronica beccabunga (brooklime) grows in the same places as watercress, but they tend not to mix. It's edible - but does not taste at all like watercress. Veronica anagallis-aquatica (blue water speedwell) is closely related to brooklime and is also edible. Veronica catenata (pink water speedwell). Essentially the same plant as the blue, except for the flower colour. The two grow together and hybridise. Cardamine amara can look very like watercress but if you taste it the difference is obvious. If you pick too much watercress to eat simply put the cress with the cut stalks downwards in a bucket and fill the bucket with clean water. Best keep it in a cool place away from hot sunlight or it may wilt a bit. In a bucket it will keep for a long time - it's a water plant - in a few days it will be growing roots! However you will probably find the submerged leaves rot away as it does not like stagnant water. If the water is agitated, the watercress does much better. If you want to grow watercress, I find it does not do too well in a pond or in standing water. Ideally it needs a cold, spring-fed stream of hard water. However, it's versatile and will grow in damp soil - you can get seeds from seed merchants. 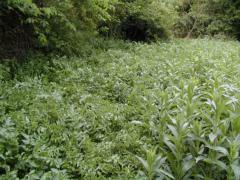 I have seen a wild watercress plant growing in the soil beside a stream and reaching the height of 5 feet. The best way to eat watercress, without any doubt, is by dipping it in vinaigrette dressing and eating it on its own. Even the stems are succulent and crunchy. But you need a wild watercress bed to do this, or it could get expensive! Watercress is not a good aquarium plant. Although it will survive for a time in an aquarium, it doesn't do well under water, so needs to be in shallow water with room to grow above water. Few aquaria can give this. You can float it - but as it grows, it will become top heavy and overturn. It's also difficult to give it enough light, so it will not flourish and will gradually become weak and spindly. 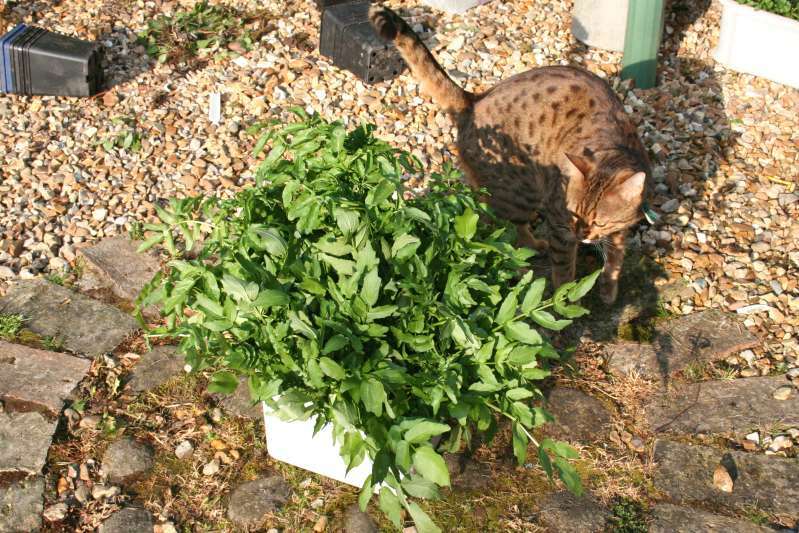 Furthermore, watercress does best with its roots cool and its head in the sun - few aquaria can approach this! Some fish do however like to eat it. Black mollies and snails will quickly demolish and dying and rotting leaves. Also, when floated, watercress sends down copious roots - which fish like for shelter. So it's another plant that you may like to try! Or how about cardamine pratensis (cuckoo flower). Rooted watercress is sold by some pond dealers for this. However simply buy a bunch of watercress and put it in a bucket of cold water. The cut ends root very easily! I have had this happen regularly when keeping wild watercress for the table: no reason why cultivated watercress should be any different! Since watercress likes very clean water, with plenty of sunlight but with cool roots - which is why it likes spring-fed beds, which have cool water. So if your pond is at all dirty (as many wild-life - therefore unfiltered - ponds are) or is not cold, then it may not thrive as a waterplant. It can however do quite well as a bog plant on the soil outside the pond. Several seed merchants sell seeds for cultivation as a salad plant which should do nicely! Page first published 20th May, 2001, revised 17th May 2008.